Indians Baseball Cards: Tribecards from Outer Space: Sunday, Sunday, Sunday! Tribecards from Outer Space: Sunday, Sunday, Sunday! Hey folks! I don't know how your Sunday afternoon is going, but I just finished helping my Father-in-Law trim limbs from my Mother's trees. It's in the low 90's here in my part of Arkansas, and the humidity is about three clicks shy of "pouring sweat." So, how better to reward myself after doing a bit of yard work? Bust some wax, of course! I'm kicking it Old School with a few packs today. LOL, well, okay, not really THAT old. We're talking late 80's - early 90's. So, let's start with 1989 Bowman "Comeback Edition." 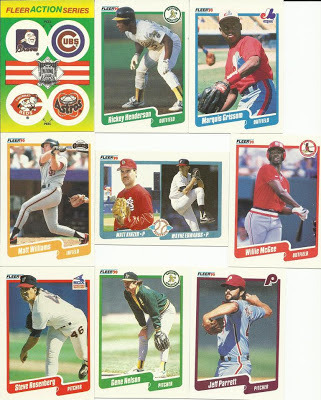 12 cards and 1 stick of old, nasty gum per pack. We basically split the pack between hits and free agents. Plus, we had a nice variety of hits across the board. Congratulations, guys! 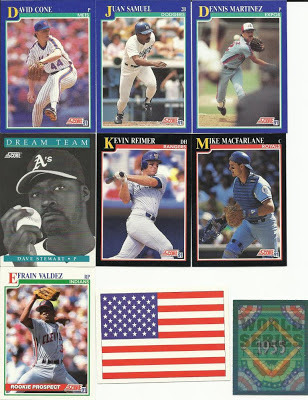 Next, 1990 Fleer 10th Anniversary Edition. 15 cards and 1 sticker per pack. Okay, let's see who snags Kinzer and ends up with the combo card. Will it be Jccsst or the person who drafts Kinzer in Friday's draft? Meanwhile, more manager love going around to some of you. Some of us, however, are feeling a bit left out in the cold despite the heat. a couple more packs might help warm things up. 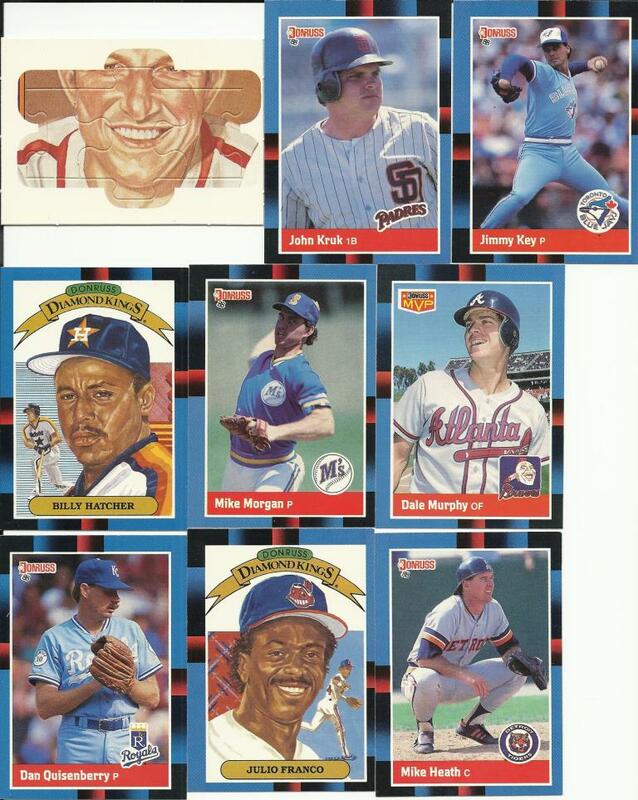 How about 1988 Donruss. 15 cards and Stan Musial puzzle per pack. Way to end that pack! Pull a Triber from the deck and hand it off to Workman. Great stuff! Speaking of great stuff, there are some winners in here for sure. Also a couple surprises. I didn't realize Buddy Bell was still up for grabs. I'll have to try for him in the draft. The last pack of the day comes to us from Score. 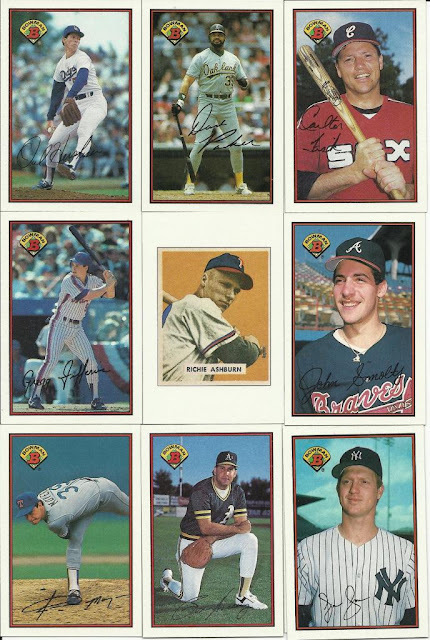 1991 Score Series 2. 16 cards and 1 magic motion card per pack. Holy smokes! Akgonzolyn steals this pack with a four-bagger! Congratulations, man! A big congrats goes out to the other managers bringing in players to their piles as well! For the record, the cards are not in piles. I'm using 800-count boxes with dividers. In fact, after the latest draft, I will have to move to another 800-count box! Things are getting too crowded with all the cards being handed out. Here's a bit of trivia before we turn things loose for the rest of this Sunday afternoon: As of this writing, there are 1130 players in the system (does not include yesterday's or today's cards). The biggest advantage to doing things this way is that next year, if I use players, I'll have a pre-built starting point by pulling the names from this year's break! Oh boy, do these bring back memories! These were some great sets back in the day, and it looks like they're still delivering on the hits! Nice pulls!